Is there light IN SHADOW? Some time ago one of the themes posted on this blog was TRANSLUCENT. That photo was taken inside Paradiso 37 restaurant at Downtown Disney in Orlando Florida. The original attraction to this restaurant was the mass quantity of colorful bottles on shelves that were backlit from a wall of windows. This photo was taken in the same spot as the TRANSLUCENT photo and in the event anyone is paying attention the bottle shapes are different. Leave it to Disney to keep things interesting right down to the window displays. 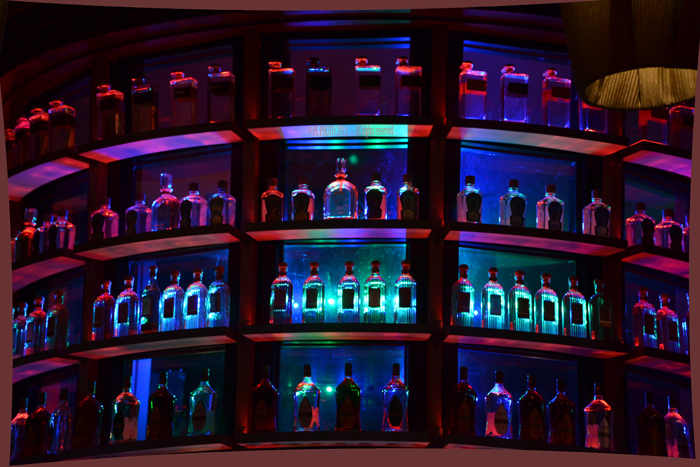 Still we have a pretty cool night view of the bottles on the shelf IN SHADOW.